Chipstead Lake Resource Centre has a fully equipped IT suite. 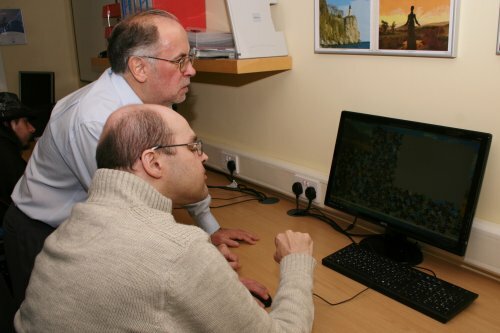 This has been designed to support people with disabilities to improve their literacy, numeracy and hand-to-eye co-ordination skills through the use of computers, in a challenging and enjoyable manner, as well as providing the means to broaden their knowledge through the modern multimedia environment in which we live in. The IT suite has friendly and experienced staff to provide advice and assistance for even the most inexperienced. All of the computers have adaptations available which enable people with all levels of disabilities and abilities to participate fully. The adaptations to computer hardware include BigTrack roller balls, BigKeys keyboards and keyguards. Each user can, where possible, have their computer customised through software configuration, to suit their own individual requirements. We have a computer which has the 'Guide' software installed with a built-in speech and screen magnifier. The IT suite is free to use for anyone who lives, works or attends Chipstead Lake services.